Mmmine! 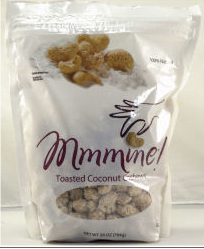 Toasted Coconut Cashews are amazing! Yes, the brand name really is “Mmmine”, so let’s get that out of the way. Now onto the cashews. Wow, they are good! I discovered these at Costco as an impulse buy. They taste like Girl Scout Somoas cookies. I barely can tell that there is a cashew inside all of that delicious, toasted coconut. There is also a hint of vanilla. I looked online to find more information, and all I saw was photos of the bagged product. At Costco they come in a plastic jar. I think I paid about $10 for about 2 pounds. If you buy these, I suggest portioning them out into individual servings, or you will quickly eat so many that you will regret buying them. But just like any addiction, you’ll be back to eating them as soon as the regret passes…. I think these would be great if you chopped them, and used them as topping for toffee, or baked goods. If you are crazy for coconut, then these were made for you. Posted in coconut, crunchy and tagged cashews, food, toasted coconut. Bookmark the permalink. So happy I have a Costco membership:-) These look amazing–will include them in my stash next trip. Thanks for headsup! You won’t be dissapointed. Thanks for reading! I saw these on Amazon and would never pay their price of almost $35 for 28 oz. Insane. We bought these at Costco for under $10. Now they don’t carry them. Why?? They are addictive!! But not to pay $30 for the same size jar. The Costco near my house sometimes has them, and sometimes not. Be sure to ask them to bring them back. They are very addictive, I agree! Yes, I am hooked, too. I’ll call to vote that they keep making them, thanks! used to get them at Costco, but they don’t stock it anymore, why? I don’t know why Costco stopped selling them, but I’ve heard that they have a 9 week selling window, and perhaps they weren’t as popular with everyone as they were with us…. I’ve been looking for these bundles of deliciousness at Costco for 6 months since I was introduced to them. Finally asked at the CS counter and the sku for that item has been discontinued!!! I’m SOO unhappy about this! I’ve left a ‘customer comment’ as was suggested and hope my Costco wakes up to a fantastic product! Please bring them back to us! It’s so frustrating when you find a great item at Costco, and they discontinue carrying it. You can buy them on Amazon, but they are a lot more $. Trader Joes makes a similar product and it’s about $7. Thanks for reading my blog!